Paul L. Carter, a certified golf course superintendent (CGCS) at Bear Trace at Harrison Bay, Tennessee, for the last 13 years, has been selected to receive the 2015 President’s Award for Environmental Stewardship by the board of directors of the Golf Course Superintendents Association of America (GCSAA). Bear Trace at Harrison Bay is a Jack Nicklaus Signature Golf Course. A 22-year member of GCSAA, Carter has been actively working to promote environmentally friendly golf from the start. A graduate of Auburn University, where he earned a bachelor’s degree in horticulture-landscape design, Carter previously won the GCSAA national public and overall Environmental Leadership in Golf Award in 2013 after four consecutive association regional awards for environmental leadership (2009–12). He also brought Bear Trace to certification in 2008 as one of just seven golf courses in Tennessee in the Audubon Cooperative Sanctuary Program for Golf Courses. The course is also one of only six in the U.S. to earn certification with the Golf Environment Organization. Bear Trace has also been recognized twice for the Governor’s Environmental Stewardship Award, in 2009 and 2012. 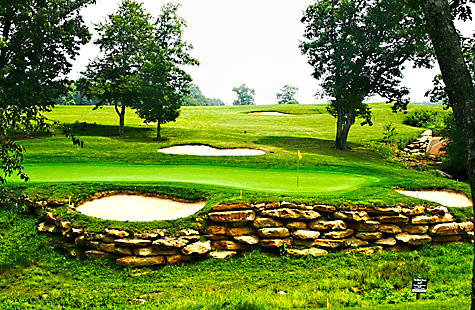 The award-winning public course is a Jack Nicklaus design that is one of nine courses on the Tennessee Golf Trail. In addition, Bear Trace has been designated a Groundwater Guardian Green Site as a result of Carter’s management, which has eliminated pollution in groundwater runoff. He has managed on-course changes as well: moving to a more suitable bermudagrass turf and reducing chemical use by 75 percent with a variety of conservation programs. He also trimmed 50 acres of highly managed turf to save more than 7.4 million gallons of water annually. “This is a tremendous honor,” said Carter. “I consider myself fortunate to be considered and even more blessed to receive the award. Carter has served as president of the Tennessee Turfgrass Association for the past two years and has been instrumental in promoting “Rounds 4 Research” for the Tennessee Golf Course Superintendents Association. For a full list of past winners, visit gcsaa.org/community/awards.